Seven Dwarfs believes in both quality and quantity, there is no point in one without the other. 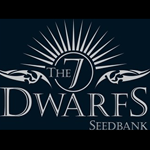 This focus on quality and yield make The 7 Dwarfs a perfect choice for the commercial cultivator and ideally suited to growers needing to make maximum use of a small space. All of the 7 feminized strains share similar growth characteristics so can be cultivated simultaneously. With a strain for everyday of the week you;ll never be bored. Maybe the sweet smell of Titan on a Tuesday takes your fancy or the mind numbing Cyclops calls out from the stash box on a Saturday. Together The 7 Giant Dwarfs will satisfy the palate of the most discerning connoisseur.